Above: The view inside our Oculus Go VR headset: getting some top-spin on some of our 3D pollen grains! Hands up who’s seen the provocative Stephen Spielberg sci-fi thriller* Minority Report? In the movie, the main protagonist, chief of ‘pre-crime’ John Anderton played by Tom Cruise, investigates a future crime via a cool gesture-based holographic virtual reality (VR) interface. Whilst current VR technology isn’t quite that far into the future, it’s certainly not far off. Indeed, virtual reality is now becoming a reality in microscopy as researchers strive to improve their 3D understanding of complex biological samples. As creator of both the confocal microscope and the head-mounted display, a forerunner of the VR headset, Marvin Minsky would certainly approve of the convergence of these two technologies. The potential is enormous: imagine, for example, being able to take a virtual tour inside a tumour, to climb into an intestinal crypt or to peel apart the posterior parietal cortex – and all without getting your hands dirty! 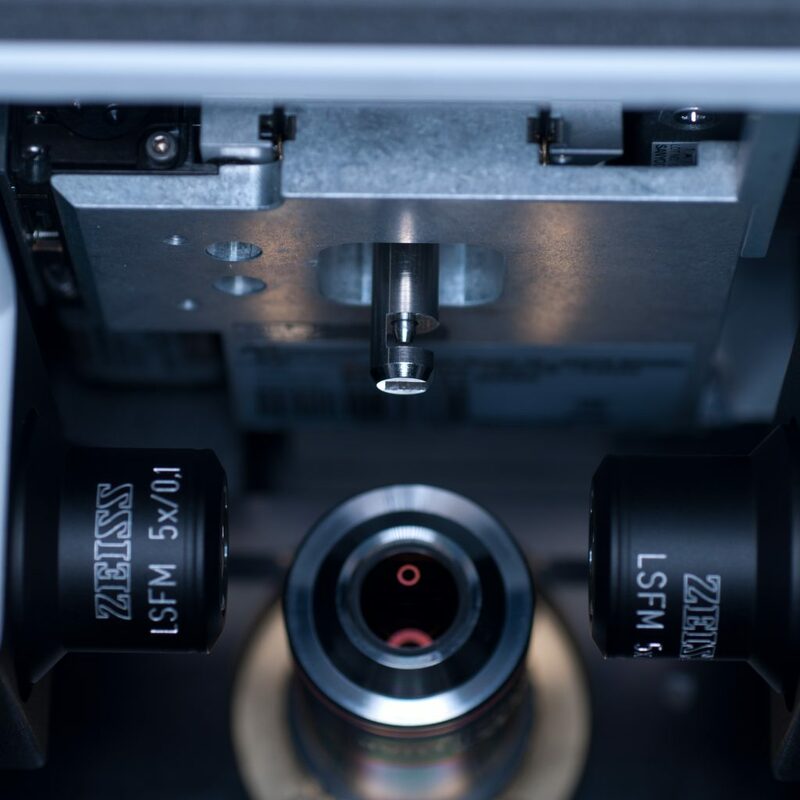 ‘Immersive microscopy’, as it is now known, is an area of imaging in which Zeiss in partnership with software developers arivis are currently leading the field (you can learn more here). To get in on the act, the Bioimaging hub at Cardiff School of Biosciences has been developing a VR application of our own for visualisation and manipulation of volume datasets generated by the hub’s various 3D imaging modalities. We anticipate that this technology will have significant relevance not only to imaging research within the school, but also to teaching and science outreach and engagement. We’ve been using the affordable Oculus Go VR standalone headset and controller in association with the Unreal 4 games engine to create VR environments allowing interaction with our whole range of surface rendered 3D models. These range from microscopic biological samples imaged by confocal or lightsheet microscopy, such as cells or pollen grains, to large, photo-realistic anatomical models generated via photogrammetry. As proof of principle we’ve developed a working prototype that allows users to manipulate 3D models of pollen grains in virtual space. You can see this in action in the movie above. We’re planning further developments of the system including new virtual 3D environments, different 3D models and object physics, and features such as interactive sample annotation via pop up GUIs. The great thing about VR of course is that we’re limited only by our imagination. To borrow a quote from John Lennnon, if ‘reality leaves a lot to the imagination’ then VR leaves a lot more! *we’ll conveniently ignore his more recent VR-themed sci-fi flick ‘Ready Player One’! 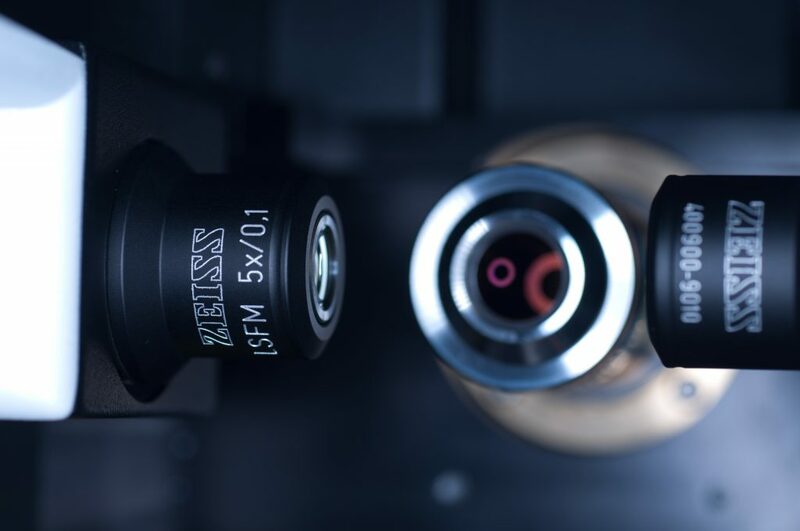 Zeiss Blog post: Virtual Reality – the New Normal in Microscopy? This entry was posted in Uncategorized and tagged Immersive microscopy, Virtual reality on February 13, 2019 by Anthony Hayes. 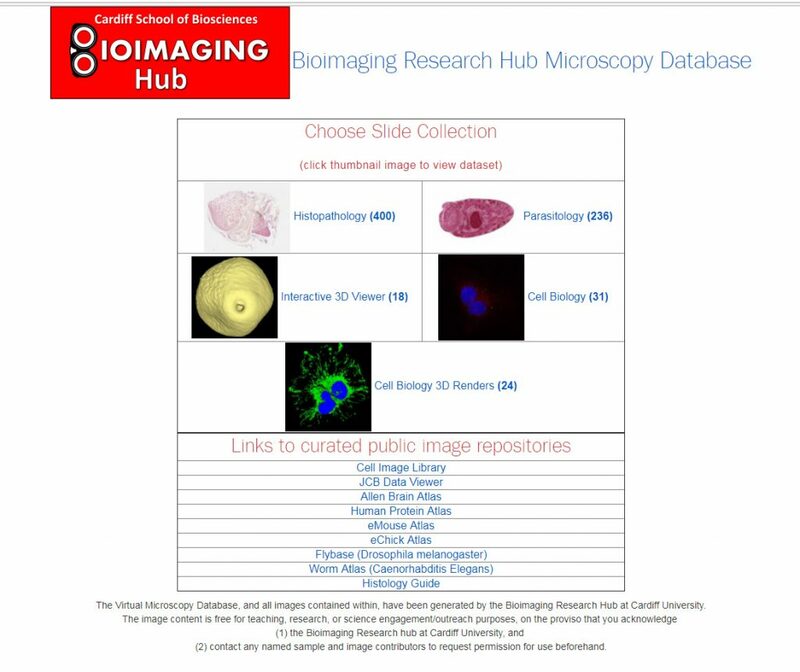 If you wasn’t already aware of the Bioimaging Hub’s SOP repository (N.B. there are shortcuts set up on all of the networked PCs within the facility), then please take a look at your earliest convenience. The database was set up as a wiki to provide Hub users with up to date protocols and tutorials for all of our imaging systems, experimental guidelines for sample preparation, health and safety information in a variety of multimedia formats in one convenient and easily accessible location. It’s still work in progress and we would welcome any feedback on how the resource could be further developed or improved. This entry was posted in in-focus, Uncategorized on January 7, 2019 by Anthony Hayes. 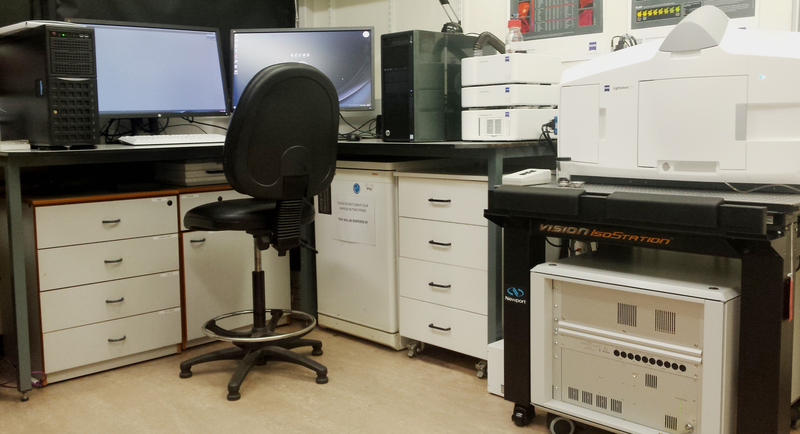 We’ve had a Zeiss Lightsheet Z.1 system in the Bioimaging Hub for a little while. In the main, the system has been used to examine small developmental organisms (e.g. zebrafish larvae) and organoids that can be introduced into the lightsheet sample chamber via thin glass capillary tubes (0.68-2.15mm diameter) or via a 1 ml plastic syringe. This is accomplished by embedding the sample in molten low melting point agarose, drawing it into the capillary tube/syringe and then, once the agarose has set, positioning the sample into the light path by displacing the solid agarose cylinder out of the capillary/syringe via a plunger. To support a new programme of research, the School of Biosciences recently purchased a state of the art X-CLARITY tissue clearing system. 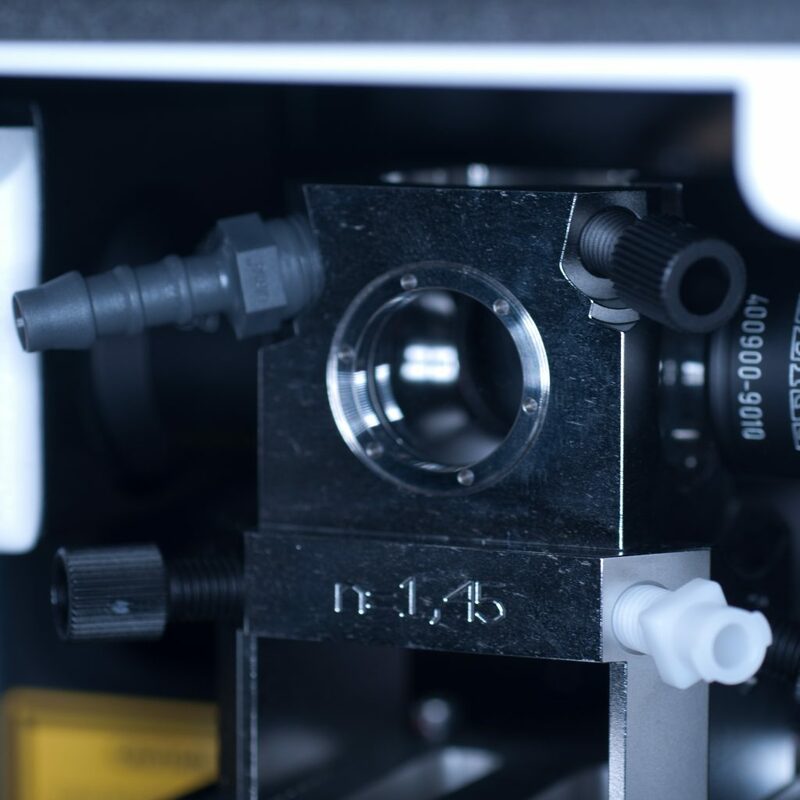 This allows much larger tissue and organ samples to be rendered transparent quickly, efficiently and reproducibly for both confocal and lightsheet microscopy. Unfortunately, due to their larger size, the samples cannot be introduced into the lightsheet sample chamber via the procedure described above. In this technical feature we have evaluated a range of procedures for lightsheet presentation of large cleared mammalian tissues and organs. The test sample we received in PBS had been processed by a colleague using the X-CLARITY system using standard methodologies recommended by the manufacturer. 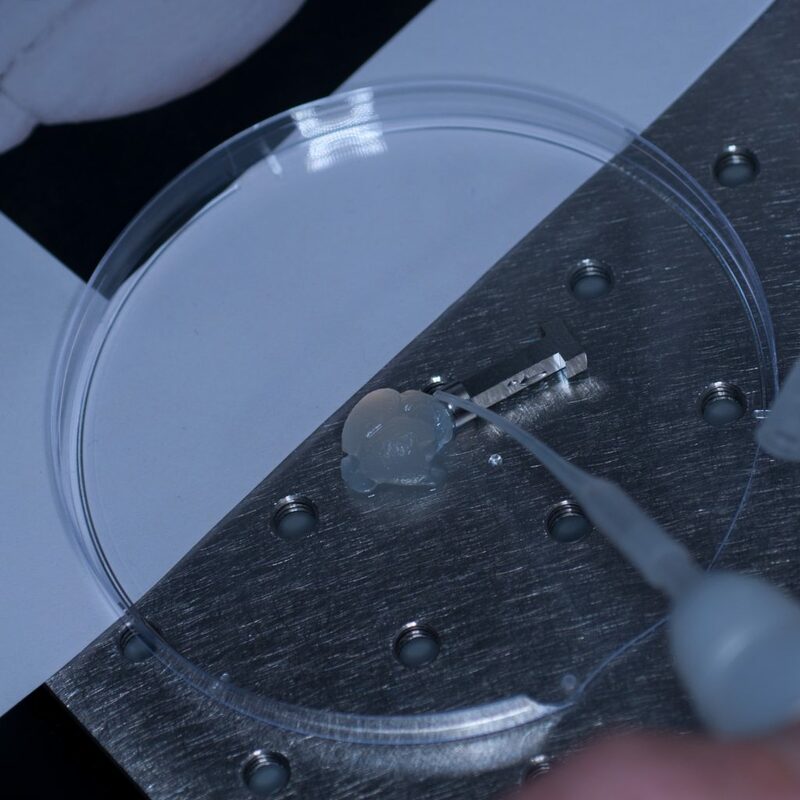 The tissue was completely transparent after clearing, however its transferal to PBS (e.g. for post-clearing immuno-labelling) resulted in a marked change in opacity, the tissue becoming cloudy white in appearance. We thus returned the sample to distilled water (overnight at 4oC) and observed a return to optical clarity with slight osmotic swelling of the tissue. 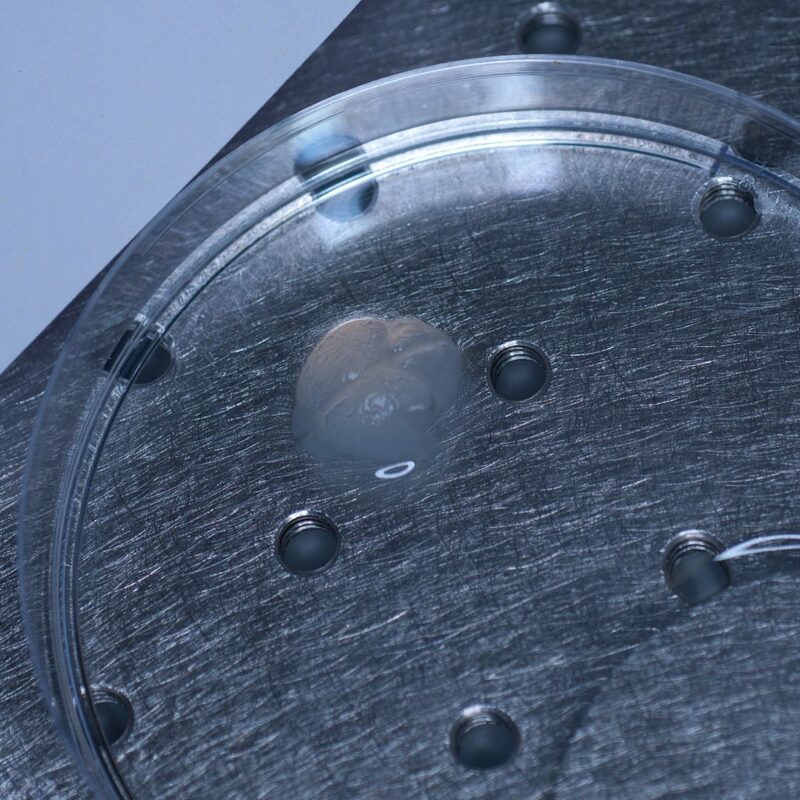 Above: The cleared sample has a translucent, jelly-like appearance. Generally, cleared tissue has a higher refractive index than water (n=1.33) and X-CLARITY tissue clearing results in a refractive index close to 1.45. To avoid introducing optical aberrations that can limit resolution, RI-matching of substrates and optics is recommended. Consequently, our plan was to transfer the cleared tissue into X-CLARITY RI-matched (n=1.45) mounting medium and set up the lightsheet microscope for imaging of cleared tissues using a low power x5 detection objective (and x5 left and right illumination objectives) which would allow us to capture a large image field. Prior to fitting the x5 detection objective an RI-matched spacer ring (see below) was first screwed into the detection objective mount. 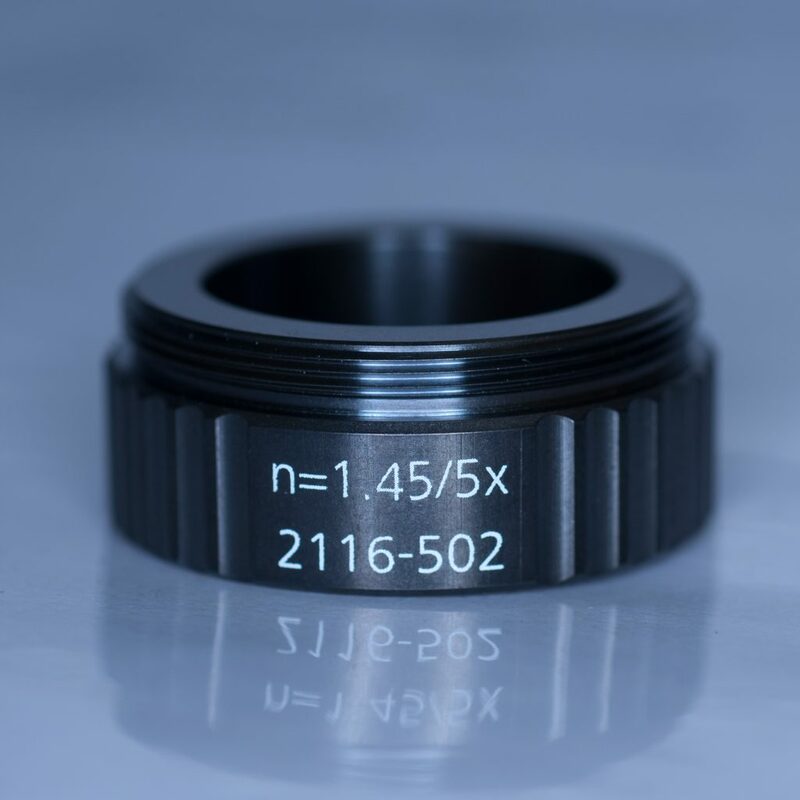 Above: Spacer ring for n=1.45 lenses. After the n=1.45 spacer ring was fitted, the x5 detection objective was screwed into place (seen centrally in below image) followed by the x5 illumination objectives to the left and right (see below). Above: Light sheet objectives. Illumination on left and right, observation to the rear. Once the objective lenses had been screwed into place, the sample chamber was inserted (see below). The use of a clearing mountant requires a specific n=1.45 sample chamber. We used the n=1.45 chamber for the x5 (air) detection objective. This chamber has glass portals (coverslips) on each of its vertical facets (unlike the x20 clearing chamber that is open at the rear to accomodate the x20 detection lens designed for immersion observation). Above: Sample chamber for clearing (n=1.45). Unfortunately, as it turned out, the RI-matched X-CLARITY mounting medium for optimum imaging of X-CLARITY cleared samples wasn’t available to us on the day, necessitating a quick re-think. As the tissue sample remained in distilled water we decided to image, sub-optimally, in this medium. To do this we quickly swapped the n=1.45 spacer ring on the detection objective to the n=1.33 spacer. We then switched to the standard (water-based) sample chamber. With the system set-up for imaging we set about preparing the tissue sample for presentation to the lightsheet. 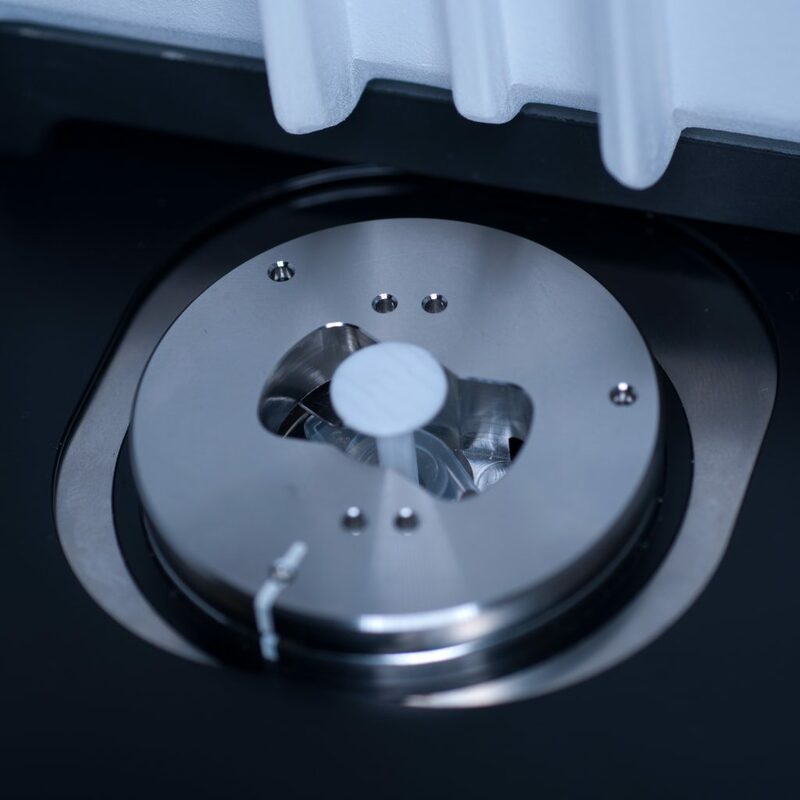 As mentioned earlier, large tissue samples cannot be delivered to the sample chamber from above, as the delivery port of the specimen stage has a maximum aperture of 1cm across. This necessitates (i) removing the sample chamber (ii) introducing the specimen holder into the delivery port, (iii) manually lowering the specimen stage into place (iv) attaching the sample to the specimen holder (v) manually raising the specimen stage, (vi) re-introducing the sample chamber, and then (vii) carefully lowering the specimen into the sample chamber which can then (viii) be flooded with mounting medium. 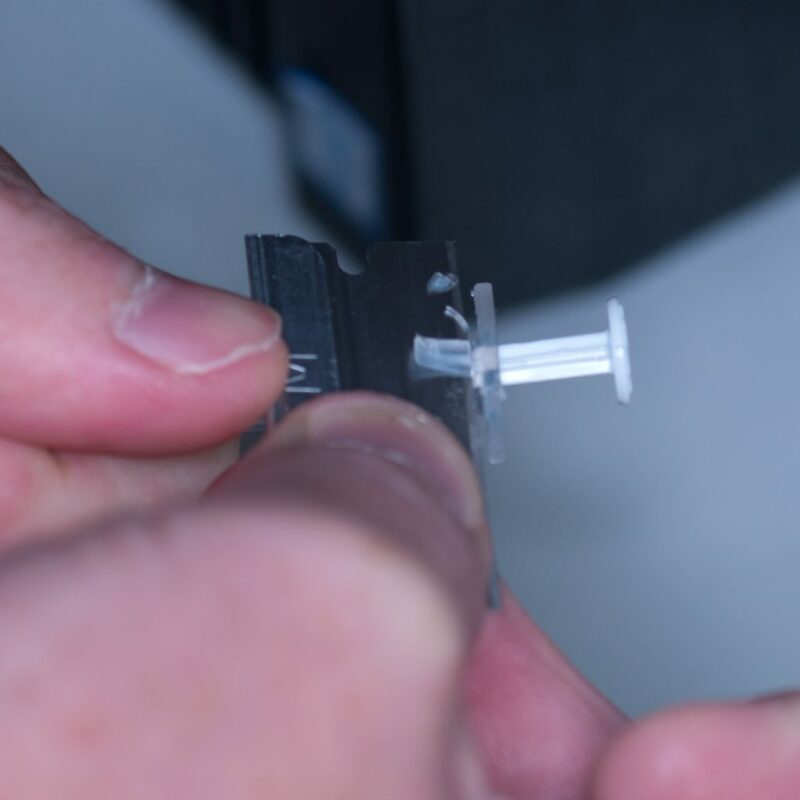 The initial idea was to present the sample to the lightsheet, as described above, by attaching it to a 1ml plastic syringe. 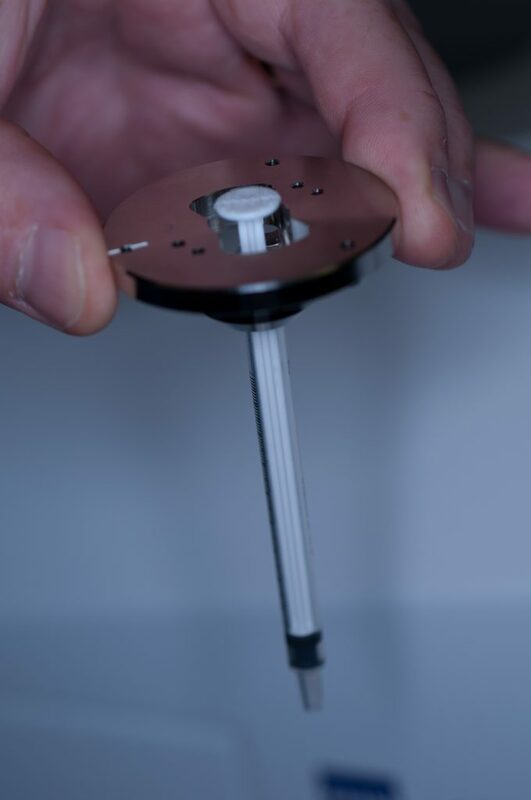 The syringe is introduced into the delivery port of the lightsheet via a metal sample holder disc (shown below). Above: Holder for 1mm syringe. 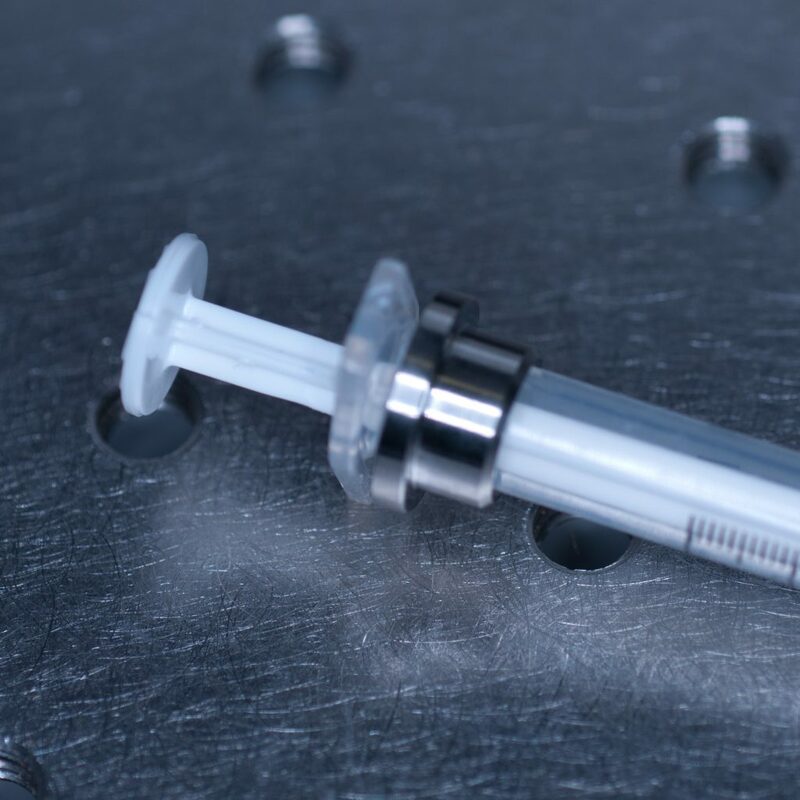 The syringe is centred in the sample holder disc via a metal adaptor collar (shown below), which must be slid along the syringe barrel all the way to its flange (finger grips). When we tried this using the BD Plastipak syringes supplied by Zeiss we found that the barrels were too thick at the base so that the the collar would not sit flush with the flange! Above: Metal collar for the syringe holder. In order to make it fit, we carefully shaved off the excess plastic at the base using a razor blade. Above: Carefully shaving plastic off the syringe to make it fit. This allowed the adaptor collar to be pushed flush against the barrel flange (see below). Above: Syringe with the adaptor collar in the correct position. The flanges themselves also required a trim as they were too long to position underneath the supporting plates of the specimen holder disc. Note to self: we must find another plastic syringe supplier! 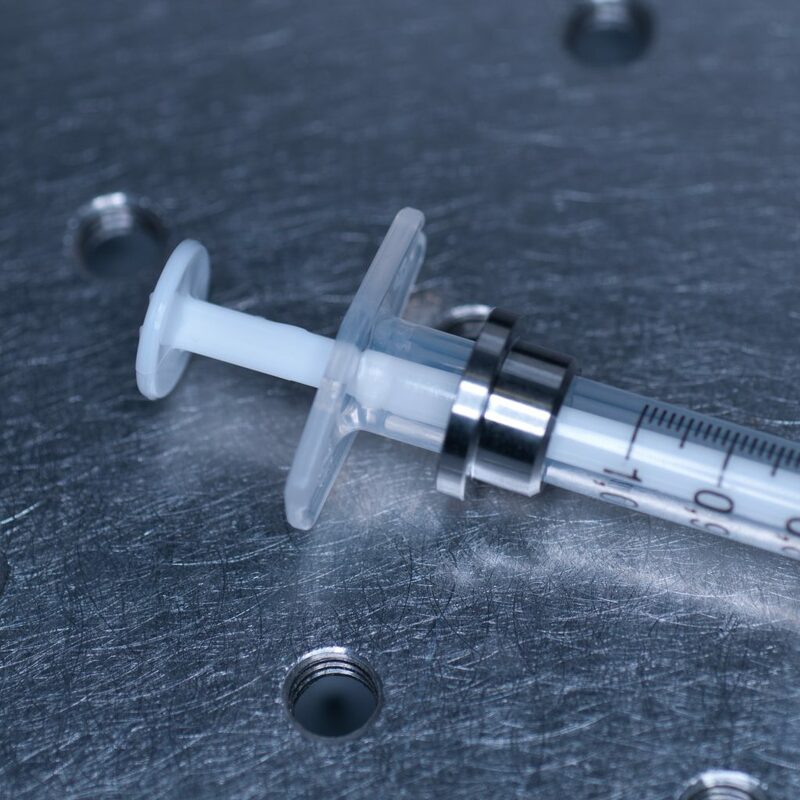 Above: Syringe plus holder inserted into the delivery port of the sample stage (note correct alignment of white markers). 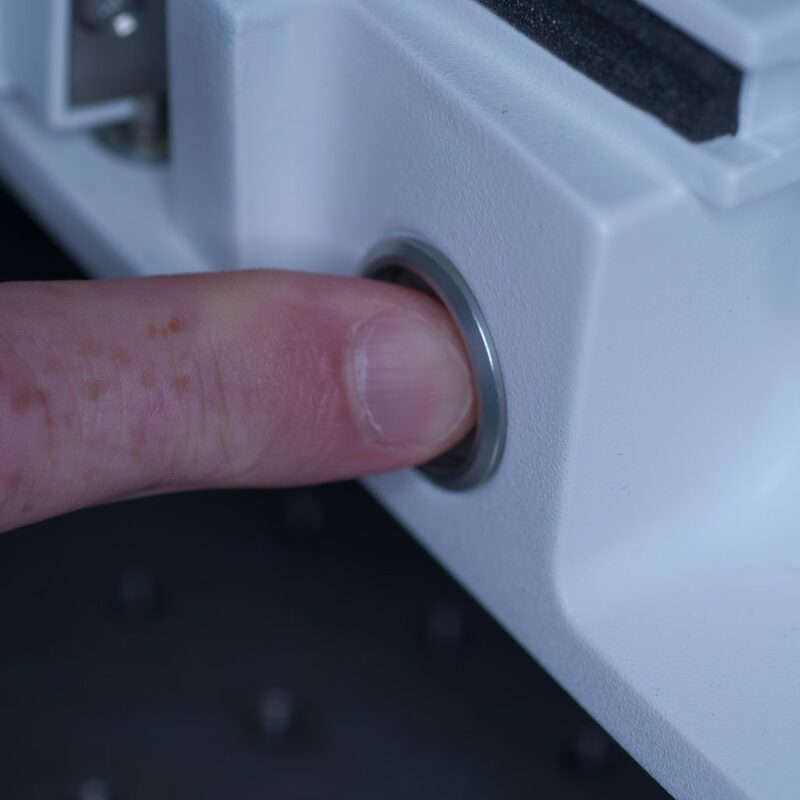 With the front entrance of the lightsheet open and the sample chamber removed, the stage could be safely lowered via the manual stage controller with the safety interlock button depressed (see below). Above: Button for safety interlock under the chamber door. The stage was lowered so that the syringe tip was accessible from the front entrance of the lightsheet (see below). Above: Syringe dropped down to an accessible position. Our first thought was to impale the tissue sample onto a syringe needle so that it could then be attached to the tip of the syringe (see below). 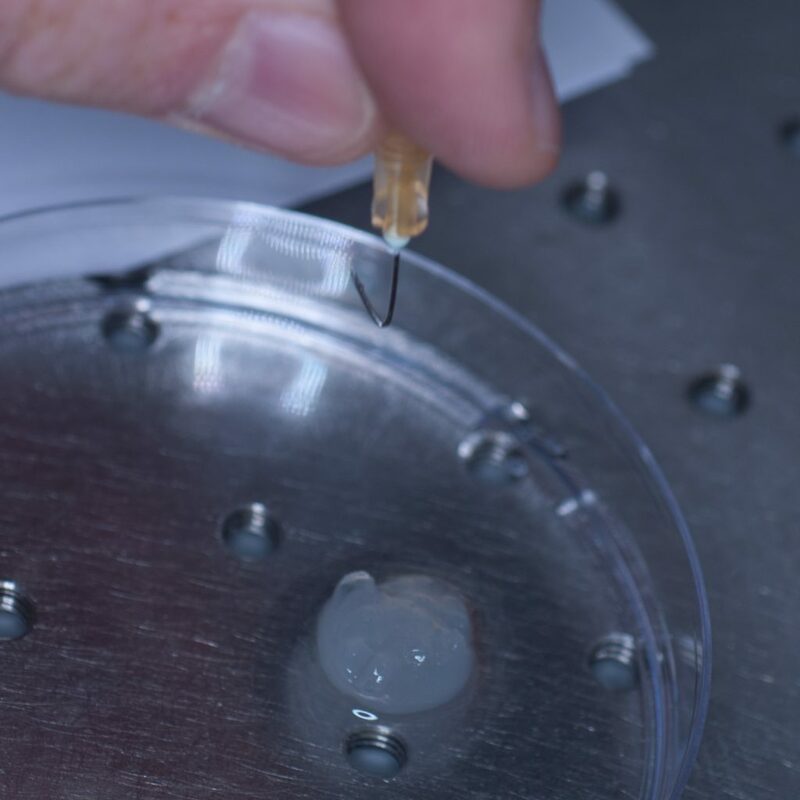 Above: Using a needle to impale the sample. However, this approach failed miserably as the sample slid off the needle under its own weight. In an attempt to resolve this problem, a hook was fashioned from the needle in the hope that this would support the weight of the tissue (see below). Above: A pair of pliers was used to bend the needle and make a hook. Unfortunately, this approach also failed, as the hook tore through the soft tissue like a hot knife through butter. We decided therefore to chemically bond the tissue to one of the short adaptor stubs included with the lightsheet system with super-glue. The adaptor stubs can be used with the standard sample holder stem designed for capillary insertion. They attach to the base of the stem via an internal locking rod with screw mechanism (shown below). Above: Sample stub for glued samples. To introduce the sample holder stem into the sample chamber (see below) we used essentially the same process as that described above for the syringe. The tissue sample was carefully super-glued on to the adaptor stub for mounting onto the sample holder stem. Above: Super-gluing the sample on to the adaptor stub. Above: Adaptor stub with tissue torn off. It seemed pertinent at this stage to reduce the sample volume as it was clearly the weight of the tissue that was causing it to detach. Having already visualised the sample under epifluorescence using a stereo zoom microscope we had a very good idea of where the fluorescent signal was localised in the tissue. Consequently, we reduced the sample to approximately one third of its original size and again glued it to the sample stub ensuring that the region of interest would be accessible to the lightsheet (see below). Above: Sample cut down to size and attached successfully to stub. This time it held. 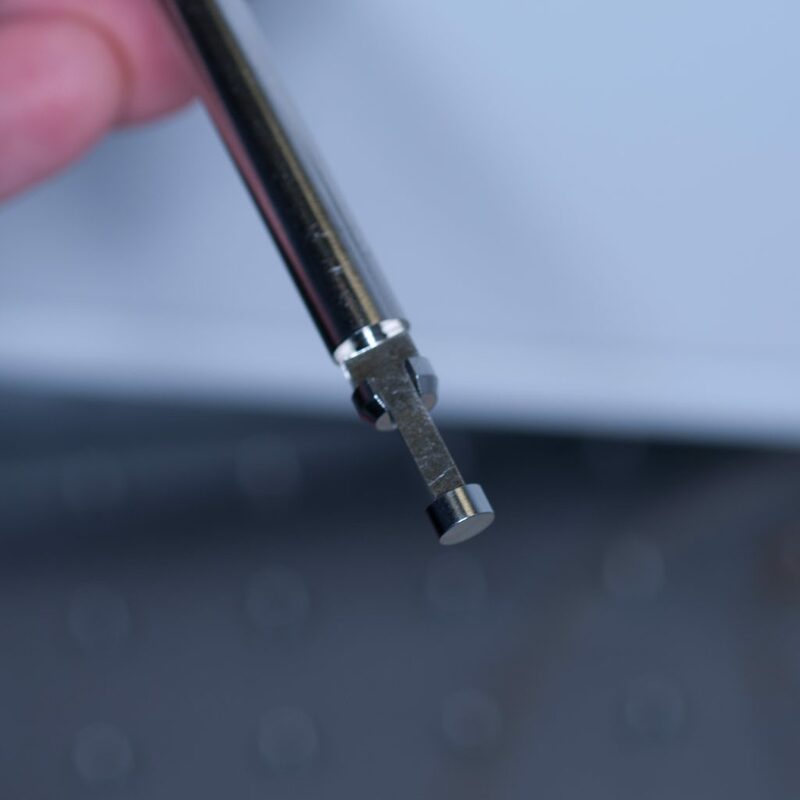 The adaptor stub was then carefully secured to the sample holder stem via its locking rod, the stage manually raised and the sample chamber introduced into the lightsheet. The sample was manually lowered into position so that it was visible through the front viewing portal of the sample chamber. The sample chamber was then carefully filled with distilled water for imaging (remember, we didn’t have any X-CLARITY mounting medium at this stage). Above: Sample positioned in the imaging chamber. With the sample in place, we then set up the lightsheet for imaging GFP fluorescence. Due to the large sample size, we found that we could only image from one side (the lightsheet couldn’t penetrate the entire sample without being scattered or attenuated). The sample was therefore re-oriented so that the region of interest was presented directly to the lightsheet channel coming in from the right. We then switched on the pivot scan to remove any shadow artefacts and set up a few z-series through the tissue. The image below shows the sort of resolution we was getting off the x5 detection objective using maximum zoom. Above: Low power reconstruction of neuronal cell bodies in brain tissue. Dataset taken to a depth of 815 microns from the tissue surface (snapshot of 3D animation sequence). It took us a fair amount of time to establish a workflow for the correct preparation and presentation of the sample to the lightsheet. However, once we had established this we were able to get some pretty good datasets and in very good time – the actual imaging part was relatively straightforward. The next step will be to repeat the above using the refractive-index matched X-CLARITY mounting medium, try out the x20 clearing objective and utilise the multi-position acquisition feature of the software. Tissue clearing and labelling, I. M. Garay; preparation, presentation and lightsheet imaging of sample, A. J. Hayes; photography, M. Isaacs; text, M. Isaacs and A.J.Hayes. This entry was posted in Uncategorized on October 24, 2018 by Marc Isaacs. Above: Maximum intensity projections of actin stress fibres (red) and microtubules (green) of an endothelial cell imaged on a Zeiss LSM880 Airyscan confocal microscope. Z-stacks were sampled via: A. 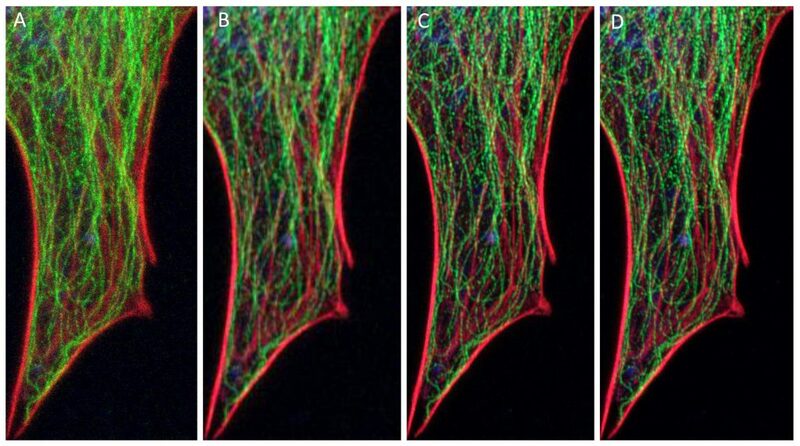 Conventional confocal optics (5 minutes scan time) B. Airyscan Fast – 0.5x Nyquist sampling (30 seconds scan time) C. Airyscan Fast – 1.5x Nyquist sampling (1 minute scan time) D. Airyscan Fast – 2x Nyquist sampling (5 mins scan time). 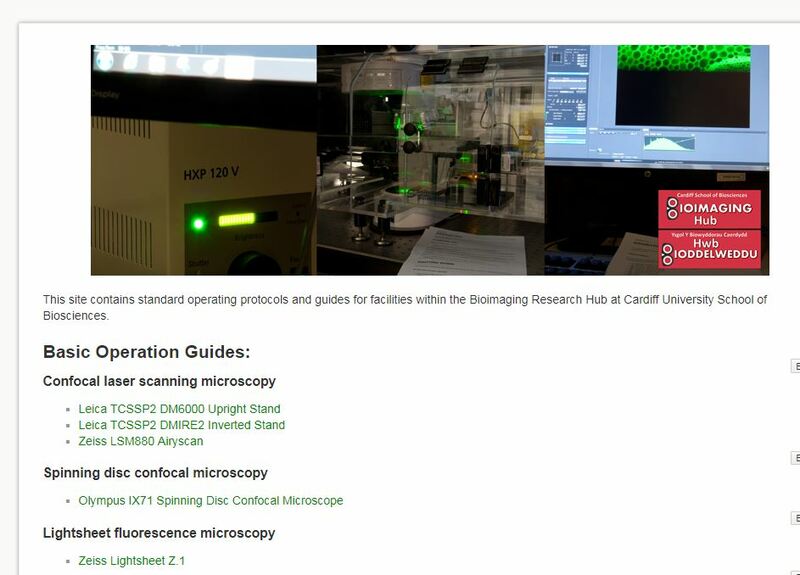 Through generous support of Cardiff School of Biosciences, the Bioimaging Research Hub has recently upgraded its Zeiss LSM880 AIryscan confocal system for fast image acquisition via the Zeiss Fast module upgrade. The AIryscan system allows imaging at a resolution 1.7x that of conventional confocal optics (find out more here) and the new fast upgrade provides a 4x speed enhancement with improved signal to noise ratio. The technique uses beam shaping optics to elongate the excitation spot along the y axis so that it simultaneously covers four lines in a single scan. This parallelisation approach, whilst increasing acquisition speeds by a factor of four, allows high pixel dwell times to be maintained resulting in high a signal to noise ratio. You can read more about the technique below or, if you would prefer, kick back and watch this explanatory webinar courtesy of Zeiss. Huff, J. (2016) The Fast mode for Zeiss LSM880 with AIryscan: high-speed confocal imaging with super-resolution and improved signal to noise. Nature Methods 13: 10.1038/nmeth.f.398. This entry was posted in Uncategorized on May 23, 2018 by Anthony Hayes. Above: Guess which animal species. Some of the 3D printed brains for the Brain Games 2018 event. How many of you can tell the difference between the brains of, say, a human, a black rhino and a Sloth bear? Nope, me neither, but apparently, when it comes to brains, it’s not just size that counts (see below). This conundrum is one of the many fab activities on offer this weekend at the National Museum of Wales annual Brain Games event funded by the Society for Neuroscience and highlighting the range of brain-related research undertaken at Cardiff University. In the build up to the event, our very own Pete Watson in collaboration with Emma Lane (PHRMY) has been 3D printing brains from a wide variety of animal species, including human, on the Bioimaging Hub’s Ultimaker 3 extended dual colour 3D printer. 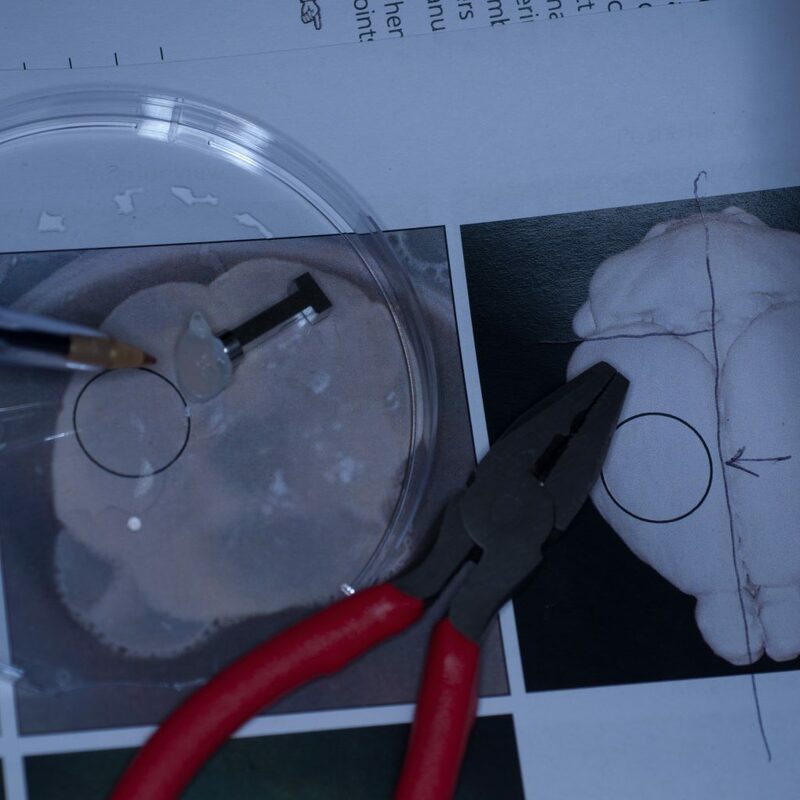 However, just to make things a little more challenging, they’ve generated two sets of 3D prints: the first set of brains are anatomically correct scale models, the other set have all been 3D printed at an identical size – and it’s up to you, dear reader, to determine which brain belongs to what animal species. Above are a small selection of the 3D printed brains that will be on display at the National Museum this Sunday, including a glow in the dark brain from…well, that would be telling wouldn’t it?! Scientific American. Fact or Fiction: When it comes to intelligence, does brain size matter? This entry was posted in Uncategorized on March 16, 2018 by Anthony Hayes. You may remember one of our blogs from 2015 about a virtual histology slidebox in development by the Bioimaging hub? If not, link here. Well, I’m very pleased to report that we’ve made considerable progress since then. The resource has now been moved from its humble beginnings (a Rasberry Pi/raid drive set-up) to a new PC server based within the Bioimaging hub. The database has also been developed significantly through mySQL which allows efficient management of the image metadata via a web interface, allowing the images to be sorted, filtered and navigated online. The image collection has also been expanded significantly; thus, in addition to the original histopathology collection (which contained approximately 400 digitised sections of normal and pathological tissues), we now have two new additional sections on cell biology and parasitology. The cell biology section contains both zoomable/navigable images and interactive 3D models of intracellular structure, including major organelles, cytoplasmic inclusions and cytoskeletal components. These were all generated from confocal fluorescence datasets imaged using our Zeiss LSM880 airyscan confocal system and rendered in 3D via Bitplane Imaris. The parasitology section, meanwhile, contains over 200 new zoomable/navigable images of various parasitic species, organised phylogenetically for easy reference and sorting. As before, these images were generated using our Navigator slide scanning system. So far, the database has been trialled for small group anatomy teaching, as well as for a number of BIOSI practical classes including Research Techniques (#BIT002), Advanced Research Techniques (#BI4002) and the Identifying Organelles (#BI2231) module. It is also utilised extensively for outreach and engagement activities within the Bioimaging hub to showcase our research capabilities. As the database is a bespoke system that has been developed in house, there are no costly subscriptions involved. We are also uniquely positioned within the Bioimaging hub to expand and develop the database according to the needs of the user. It therefore has enormous potential as a centralised repository for microscopical image data for teaching, research and outreach/engagement purposes. We are planning to add additional sections on plant biology and entomology and we would welcome collaboration with any BIOSI staff who have access to the relevant slide resources and would be happy to help in curating these collections. Ultimately, the plan is to find a permanent home for the virtual microscopy database as part of the new e learning and assessment facility (eLEAF) within BIOSI. Please take a look at the database here: http://vmdb.bios.cf.ac.uk/. Any feedback (+/-) would be welcome. Thanks again to all involved so far. This entry was posted in Uncategorized on December 18, 2017 by Anthony Hayes. Above: Not to be sneezed at: 3D pollen prints for the Met Office (grass, green; oak, yellow and birch, blue). Disclaimer: If you suffer from hayfever then please avoid spending too long on this page – it may be detrimental to your health! I bet you didn’t know that one in five people suffer from hayfever and that 95% of pollen sufferers are allergic to grass pollen in the UK alone? Well neither did I until I visited the Met Office’s really informative pollen forecast website. 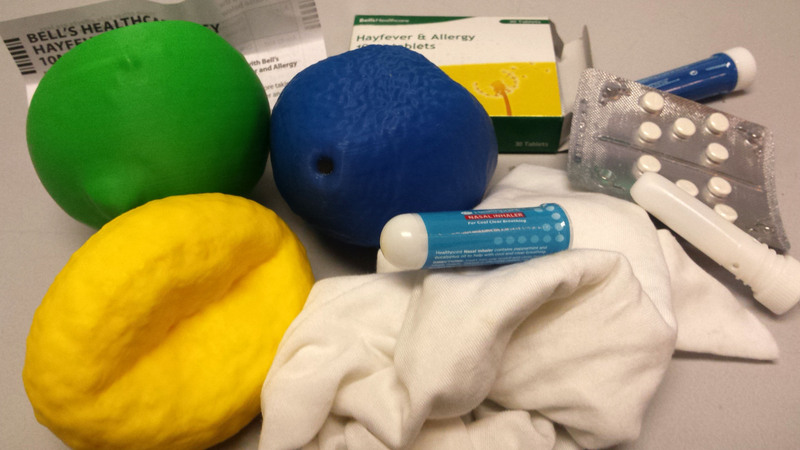 Having read some of our previous blogs (here and here), the Met Office recently asked the Bioimaging Hub if we would generate 3D printed models of some of the worse culprits (shown above) for their outreach & engagement programme to help promote awareness of hayfever. The 3D prints were generated from surface-rendered confocal microscope volume datasets with help from BIOSI 3D printing. We’ve used the technique to generate physical models of a variety of microscopic samples ranging in size from subcellular organelles to whole developmental organisms. If you’re interested, then further details of the methodology are available below. Perry, I., Szeto, J-Y., Isaacs, M.D., Gealy, E.C., Rose, R., Scofield, S., Watson, P.D., Hayes, A.J. (2017) Production of 3D printed scale models from microscope volume datasets for use in STEM education. EMS Engineering Science Journal. 1 (1): 002. This entry was posted in Uncategorized on July 26, 2017 by Anthony Hayes. 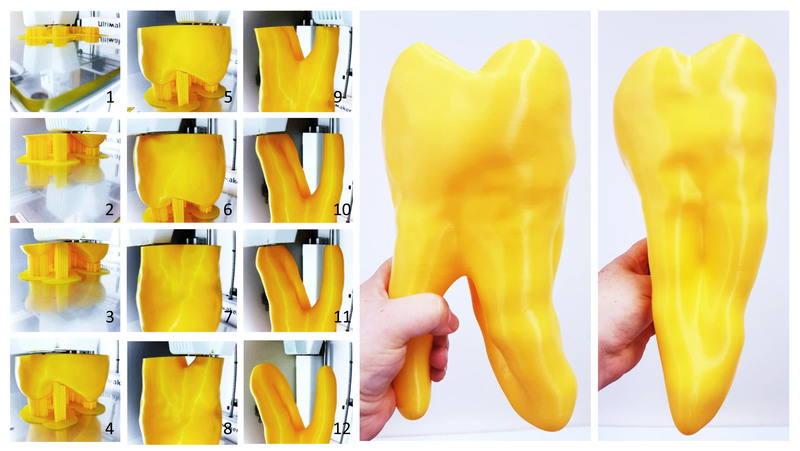 Above: ‘Crowning glory’: Webcam shots (1-12) showing stages in the process of 3D printing a giant human molar (left) and the resultant 3D print with support scaffold removed (central and right). 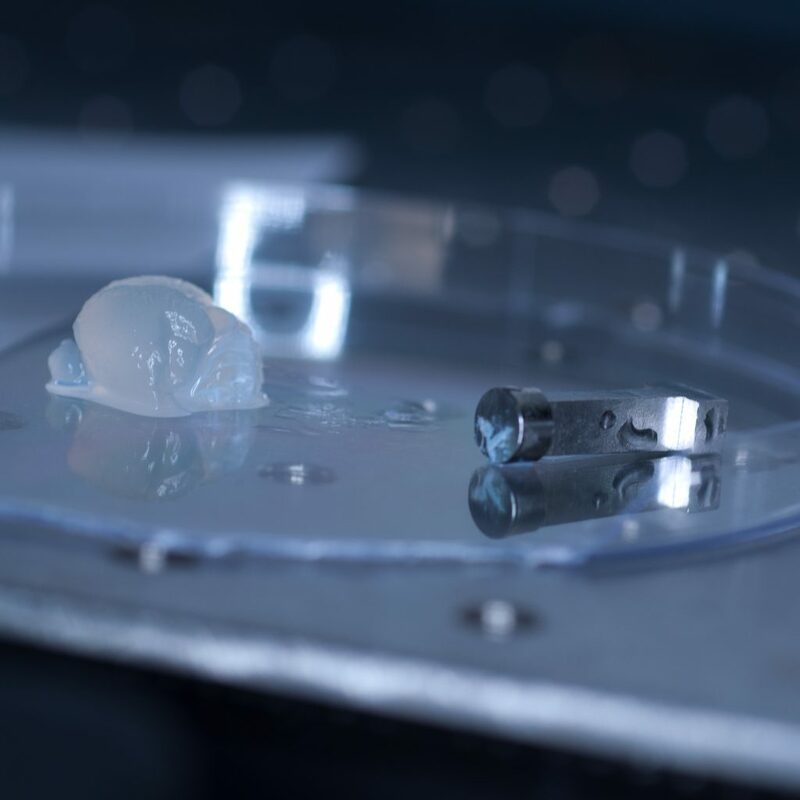 The other day we were presented with a problem: was it possible to generate a 3D model of a human tooth that could be used for dental teaching and outreach purposes? The only thing was, the individual concerned didn’t specify the desired size. With a build volume of 215 x 215 x 300mm and printing resolution of 20-200 microns, our new Ultimaker 3 Extended 3D printer can print BIG, so what better application to put the new instrument through its paces! After a quick search on Thingiverse.com, we downloaded a stereolithography (.stl) file of a human molar tooth segmented from computed tomography (thanks to fvillena). We decided to print it as big as we could, but using the lowest print resolution and lowest level of infill. The results, shown above, are quite impressive – it took approximately 24 hours to print the tooth (crown-side down, root-side up) and with the support scaffold removed resulted in a 3D model approximately 300mm in height – about the same size as tooth from an adult T-Rex!! I suppose we can now be accused of (wait for it…) getting a bit long in the tooth! This entry was posted in Uncategorized on July 5, 2017 by Anthony Hayes. Above: Some of the class microscopes in various states of dismantlement. 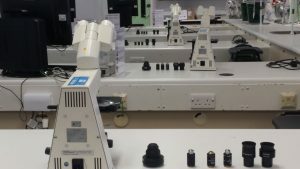 It goes without saying, to get the very best out of a microscope you need to know how to optimise and maintain its performance. That said, you’d be surprised just how many microscopists don’t know how to properly set up and maintain their microscopes. Recently, we run our first microscope maintenance course as part of Cardiff University’s Continuous Professional Development (CPD) programme. We can’t tell you who it was for; but suffice to say, they use microscopes a lot in their work. 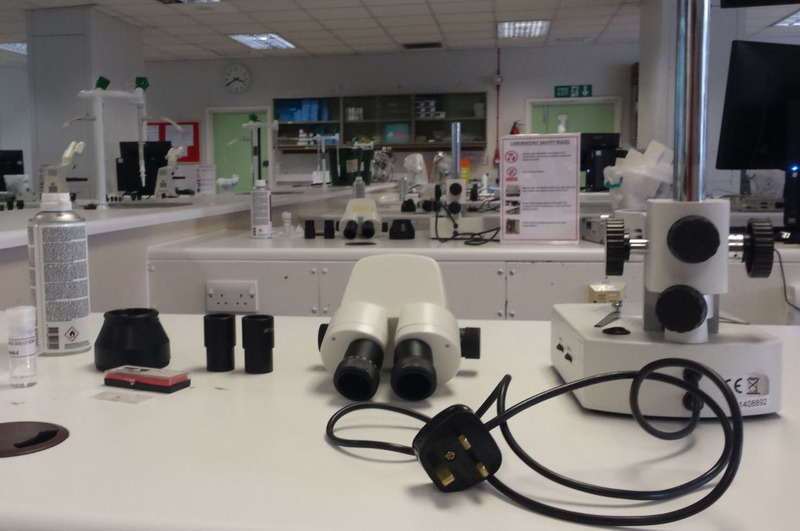 The two day course covered the basics of light microscopy and the procedures necessary to keep a microscope squeaky- clean and correctly aligned. The practical element of the course saw delegates clean, rebuild and align both upright widefield and stereo-zoom microscopes. This entry was posted in Uncategorized on June 19, 2017 by Anthony Hayes. 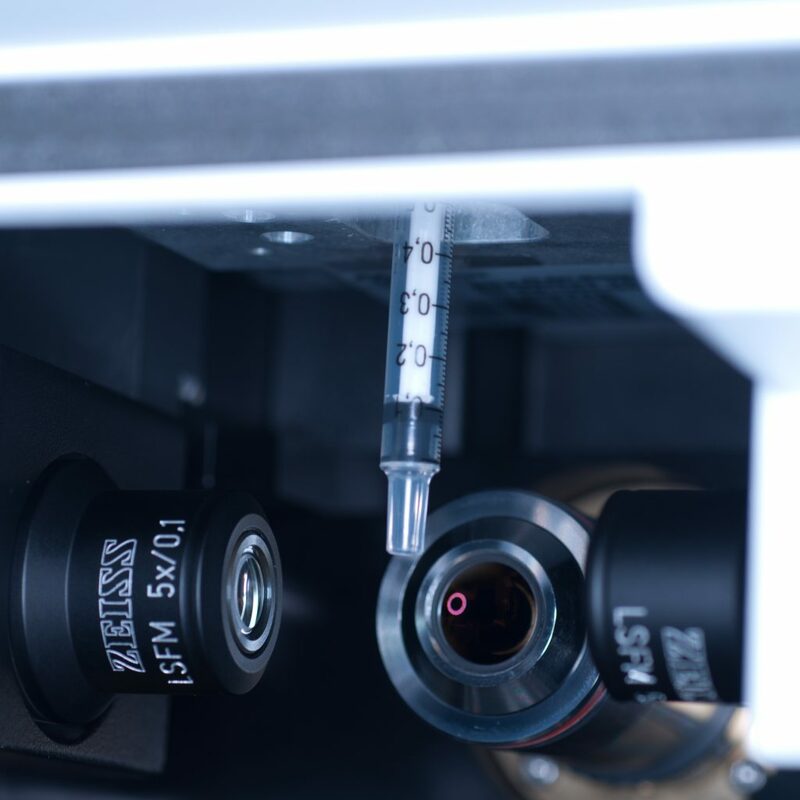 Above: Tripping the light fantastic: the new Zeiss Lightsheet Z.1 fluorescence microscope. 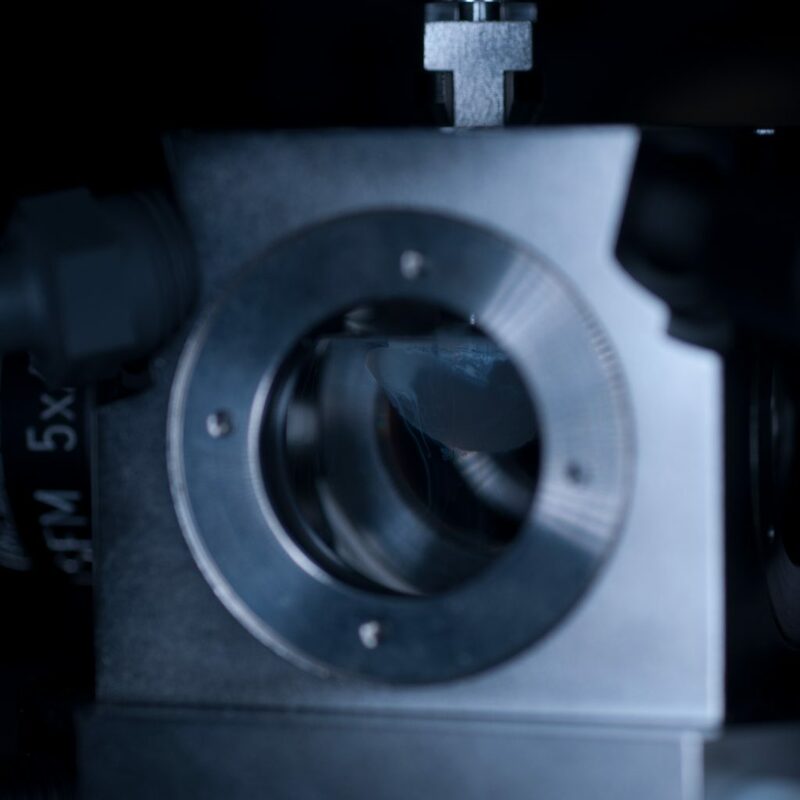 A state-of-the-art, Zeiss Lightsheet Z.1 system has recently been installed within the Bioimaging Research Hub (BIOSI 2; E/0.03). 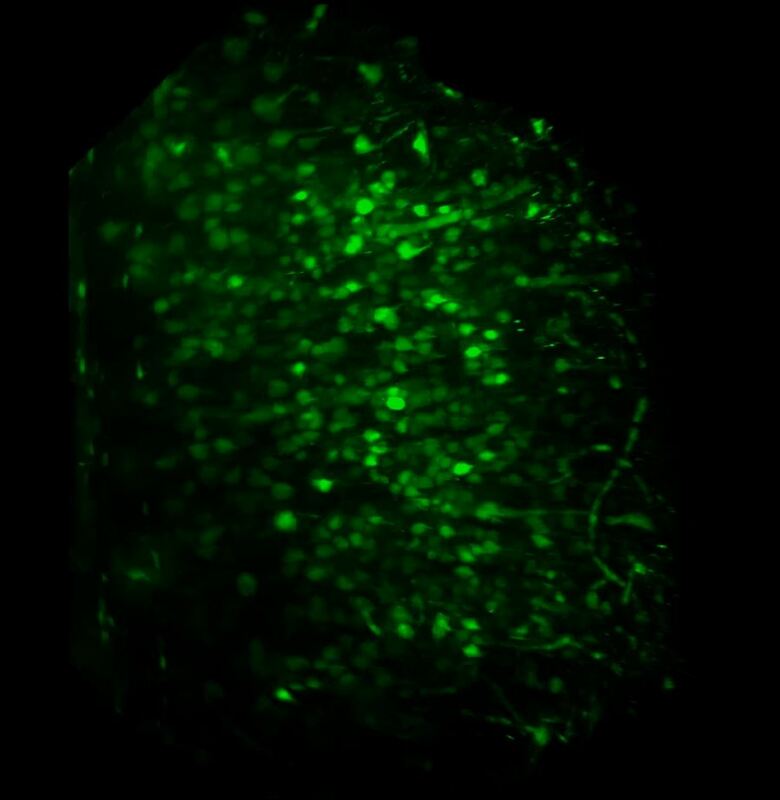 The single plane illumination microscope (SPIM) allows fast and gentle multi-channel 3D/4D fluorescence imaging at the sub-cellular level. The system offers the potential of whole organ imaging of fixed cleared samples and can provide an unprecedented insight into developmental processes occurring in live model organisms such as Arabadopsis thaliana (Thale Cress), Danio rerio (Zebrafish) and Drosophila melanogaster (Fruit fly), and in vitro organoid at a high spatio-temporal resolution. Further information about this system is available via the Bioimaging Hub equipment database. This entry was posted in Uncategorized on February 2, 2017 by Anthony Hayes.